Learn how to survive in a Spanish speaking country! Did you know that Spanish is the second most spoken language in the world? Spanish is the official language of 22 countries, the second most important diplomatic language and the third most used language on the Internet. In addition, major world organizations such as the UN, UNESCO and MERCOSUR have adopted Spanish as one of the official languages. Spanish is known to be one of the fastest languages in the world. The Spanish language is in full growth. Spanish is one of the most used languages in the business world, as such, Latin America is becoming a region of vital business importance. Speaking Spanish helps to deepen the knowledge of Latin culture by promoting a deeper understanding of its culture and history. Several works of the modern era were created by artists of Spanish origin, such as Miguel Cervantes, famous book Don Quijote, Guillerme del Toro and Spanish director Pedro Almodôvar. There are a multitude of untranslated books, events or specialized websites that have Spanish as their official language and can only be enjoyed in their entirety with the knowledge of the language. With this course, Everyday phrases in Spanish, you will be able to learn the most used phrases in Spanish. You can manage your time and learn at your own pace. With the help of flashcards it will be easier to memorize and learn to speak Spanish. This course is a way to learn Spanish in a fun way. You will have access to varied vocabulary, you will be able to learn the most used Spanish words, basic Spanish words and Spanish phrases adapted to the most varied situations. You will have access to lessons to communicate on public transport, at school, at a bank and many more places in your daily life. With this app to learn Spanish, you will not lack reasons to learn Spanish in a practical and intuitive way. 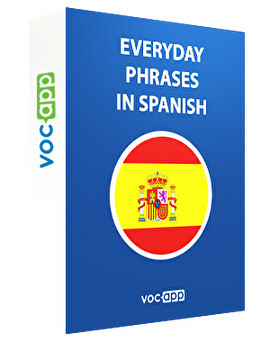 Learn Spanish may seem an impossible task, but thanks to our memorization system, it is easier to memorize Spanish phrases, Spanish words, thanks to the selection that the Vocapp team made of Everyday phrases in Spanish.